In the 62nd issue of the Bed and Breakfast E-Traveller, we take you to the Eastern Townships in Québec: New England charm with a Québec flair. 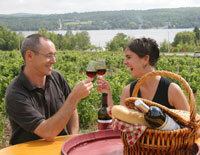 The Eastern Townships offer endless opportunities for a fun, girls only, getaway. Our region is dotted with postcard pretty villages where you can shop till you drop and max out your credit card (well, maybe not quite). Mountain and lake communities like Sutton, Knowlton, Magog and North Hatley, are chockablock with art galleries, specialty stores and pastry shops (chocolate cake anyone? ), as well as clothing boutiques and antique barns and shops. For antique furniture and objets d’arts, head over to Stanbridge East, Dunham, Eastman or along Chemin des pères. Along this road, which skirts the shores of Lake Memphrémagog, there’s also a nordic spa, a soap manufacturer (handmade toiletries) and Abbaye de Saint-Benoît-du-Lac, a Benedictine monastery renowned for its prize-winning cheeses. Then there’s Sherbrooke, « capital » of the Eastern Townships. In the heart of downtown is the Musée des beaux-arts (Fine Arts Museum), a rich repository of artwork by regional and Canadian artists, housed in a grand, nineteenth century structure, the one-time Eastern Townships Bank. Don’t forget to pack your camera! Every Townships’ community has interesting architecture, scenic surroundings and a unique charm of its own. Besides —- you’ll want to record all those memorable moments with your pals, recalling old times and toasting each other’s friendship over a glass or two of wine. OK guys, rev up your engines and head for the Eastern Townships! Weeeell, perhaps that’s a bit of a cliché… You may prefer to meander around our back roads, following one of our tourist circuits. However you get here, you’ll find that our region of lakes and mountains is one giant playground, tailor-made for outdoor activities. The rolling countryside gives you plenty of opportunity to challenge your testosterone levels in a variety of ways — even if you’re a wimp whose idea of activity is hoisting a cold one on a hot summer’s day! How about hurtling down the slopes of Mont Bromont on a mountain bike? There are 100 kilometres of dedicated cycling trails at SkiBromont.com. More bike trails await in East Hereford and the Coaticook Gorge Park. Wanna play Tarzan? (No guarantee you’ll meet Jane, but you never know…) Canopy walk in Eastman and Sutton, where you can climb and jump and swing across the treetops, along a challenging course of logs, ropes and swaying bridges. Like even more of a bird’s eye view? Try leaping out of a plane at 200 kilometres an hour. The adrenaline rush is amazing! 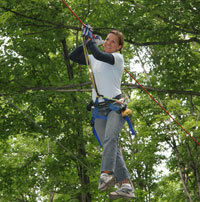 The instructors at Parachutisme Nouvel Air will give you the low-down. If you’re a water rat, grab some air wakeboarding on Lake Massawippi. On second thoughts, maybe you’d just like to loaf on the deck of a catamaran - Aquilo 36 — as it skims across Lake Memphrémagog. Lovers wanted! 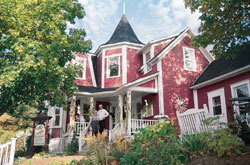 The Eastern Townships, with a little help from Cupid, sets the scene for a romantic holiday, offering quiet country roads that wind around a stunning landscape of mountains, lakes and heritage-laden villages; cosy bed & breakfasts and country inns (love nests by any other name) and restaurants whose menus tantalize the palate with tasty, mouthwatering treats that are almost as good as… well, you know what! You and your significant other may well have been together for years, but that doesn’t mean the bloom is off the rose. A trip to the Townships is guaranteed to rekindle those feelings of affection that attracted you to one another in the first place. Our spectacular scenery and the intimate nature of the countryside (not to mention delicious regional cuisine), will kick your senses into high gear, setting the mood for love. Wander into a bakery and inhale the tantalising scent of oven-fresh bread. Nibble on a pastry (and maybe your loved one too, if nobody is looking! ), order a steaming cappuccino, sit down and plan a romance-filled outing. At the top of your agenda: a visit to the region’s artisan food producers — wineries, orchards and a unique lavender farm, to name a few. They’re linked by scenic (and easy-to-follow) circuits: the Wine Route and the Exquisite Travels. Along the way, pick up the ingredients for an al fresco picnic. Looking for a romantic spot to tuck into your regional goodies? A covered bridge will surely fit the bill. In days gone by, these wooden structures were known as « kissing bridges » because their high walls gave courting couples privacy from prying eyes. Go ahead. Steal a kiss or two between bites!